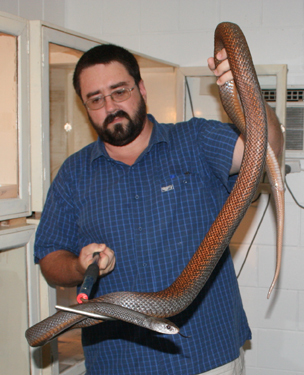 Welcome to Australian Herpetology ONLINE, my name is David Williams, and I am an Australian herpetologist and clinical toxinologist who is currently based in Port Moresby, Papua New Guinea where I am undertaking research into the epidemiology and clinical management of snakebites. Papua New Guinea has some of the highest incidence rates for snakebite anywhere in the world, and in some parts of the country deaths from other causes like malaria and tuberculosis are outnumbered by snakebite deaths 3 to 1. My research activities are not just intended to enable me to write a great thesis and publish interesting papers in professional Journals. I have a passion for helping Papua New Guinea to make truly sustainable improvements to the prognosis of snakebite patients. Unlike many of the world's human illnesses, for which there are no long-term cures, snakebite is a treatable disease. Sadly ignorance, lack of access to essential antivenoms, poorly trained and under-resourced health services, and absent funding often mean that patients whose lives could easily be saved, are sacrificed. My goal is to deliver comprehensive long-term solutions that can change this, and this website provides information on many of these activities. Apart from my work in Papua New Guinea, my interests in snakebite, and in improving the outcomes for victims, are global, and I am hoping to eventually take the lessons learned in Papua New Guinea, and the solutions we develop to a wider audience throughout the tropical developing world. In the following pages you will find accounts of field work and research, teaching activities, development projects and my own personal observations on snakebite and herpetology-related issues and some multimedia titbits. The website includes an extensive collection of scientific papers, research monographs and other items that are available in Adobe Acrobat PDF format for FREE download for personal use. These papers cover a huge range of subjects including reptile palaeontology; species diversity; evolution, phylogenetics and taxonomy; behaviour and ecology; captive management; venom composition, toxinology and snakebite. This site is an information website. I do not deal in reptiles, and none of the animals shown here are available for purchase.